BMW has announced the first bit of official pricing information for the upcoming all electric BMW i3 and with a base price not including destination of $41,350 – the i3 costs a bit more than some reports circulating the internet two weeks ago. 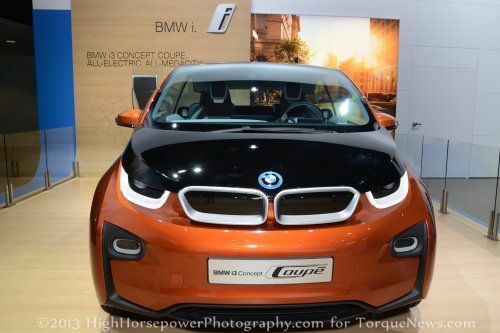 Two weeks back, we discussed the rumors that the 2014 BMW i3 would carry a starting price between $35,000 and 40,000 with some reports suggesting that pricing was likely to stick near (or below) the bottom of that range. Unfortunately for those hoping to score an emission-free BMW for less than $30,000 with the many incentives offered to electric vehicle buyers in the US, the actual base pricing for the i3 is $42,275 including the current destination fee of $925. While it would have been nice for prospective EV buyers to be able to score a new i3 for $35,000 before any incentives, that price would have made the i3 one of the least expensive models in the BMW USA lineup and that really doesn’t seem reasonable. When we look at the pricing of the most popular electric vehicles in the US market, we have a list comprised of the Chevrolet Volt ($39,995), the Nissan Leaf ($29,620), the Ford Focus Electric ($35,995) and the Tesla Model S ($63,570). Compared to these models, the i3 sits towards the upper end of the pricing scale but considering that it is a high tech EV from a luxury automaker, the pricing is very reasonable. Also, when you factor in the various incentives for buying an electric vehicle in the US which can reach $10,000 in the right situations, the new BMW i3 will end up costing buyers somewhere in the range of $32,000-35,000 and that effectively makes the i3 one of the least expensive BMW options in the US. Of course, this is dependent on the i3 being subject to the same local and federal incentive programs as the rest of the vehicles on the list but I don’t see any reason why the i3 would apply to the same cost-cutting offers as the Leaf or Volt. We should keep in mind that this initial pricing for the BMW i3 is for the base model, all-electric version but if the i3 follows similar pricing structure to the rest of the German automaker’s – we can expect that there will be plenty of options to bring that price much, much higher. Paint options, interior upholstery options, infotainment technology packages and what we would expect to be a long list of ala carte options could bring the price up into the $50,000 range (if not higher) but those buyers who are happy with driving a “base model BMW” – the i3 will be available for just over $42,000 before any incentives, discounts and tax credits. The new BMW i3 will make its global debut at simultaneous events held in New York City, London, England and Beijing, China on Monday July 29th. At that point, we should get a full spread of details on the new i3 including information on the extended range models due after the all electric versions have launched. The extended range i3 will feature a powerful gasoline engine that serves as a high performance generator to charge the battery once depleted – a system similar to that in the Chevy Volt. When it arrives, the extended range i3 should have a price at least a few thousand dollars above the pure electric i3 but with this extended range model not planned to arrive until after the Q2 2014 dealership debut of the all-electric i3, it could be some time before we get the full details on the BMW i3 sans the range anxiety.